Your home is your own personal kingdom. It’s a place where you dwell and have one-hundred percent control on how you choose to design, rearrange and fix it. When it comes to your home, you are the master of your own domain. But it’s important to realize that your domain accumulates clutter from time to time as well. There are always going to be items that seem to never stay in its place. Usually this is because those items are much-needed essentials that you happen to use on a regular basis. Or sometimes, you just can’t find a proper place for them. Nevertheless, when you have company over or just need to take a breather, those eyesores can be quite distracting. 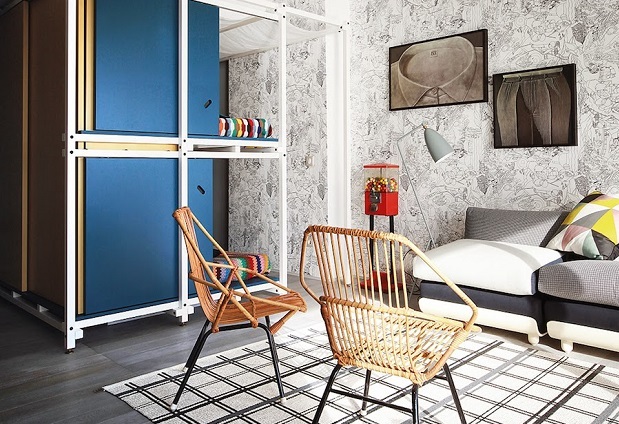 Today, we want to provide you with some creative ways to hide unsightly items in your home so that it can get conveniently mistaken as one of the immaculate homes featured in the best magazines. You’ll thank us later! For some of us, our pets are like our own children. They are loving, playful and full of light and joy. And, just like children, they love to run around and get into things as well. Add that to the fact that they don’t have opposable thumbs to pick up their messes and you have the perfect recipe for a tornado of toys and dog food particles of all kinds to come rushing through. 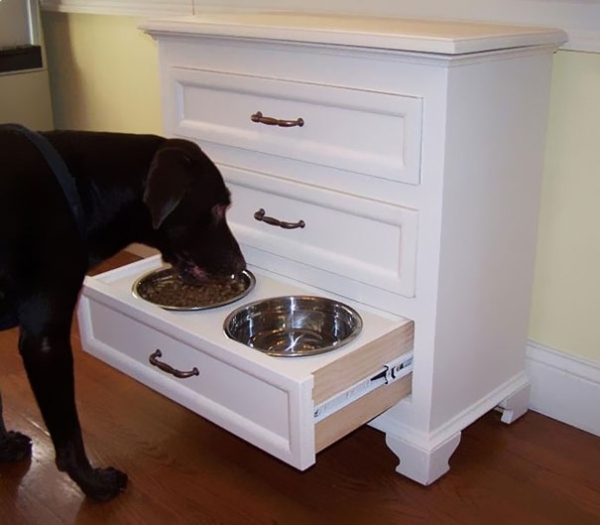 Instead of keeping your dog’s feeding bowls out in the open for all to see (and sometimes smell), repurpose an old dresser and designate the bottom drawer as their food storage. 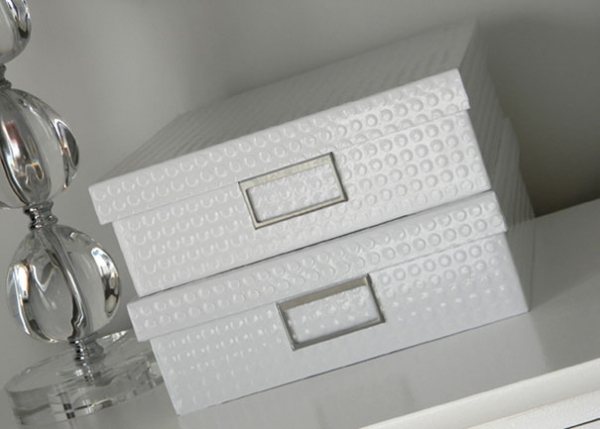 Not only will this help to de-clutter your home, but it will also keep it out the reach of any pesky bugs. 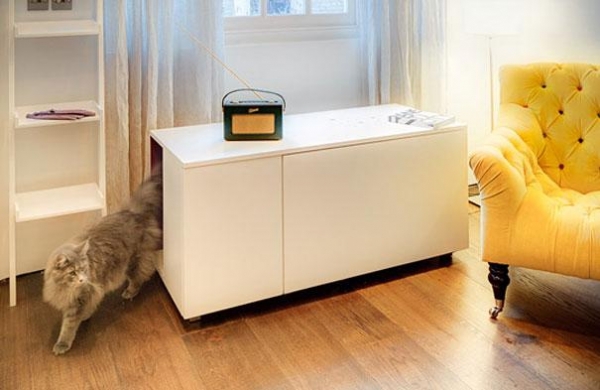 If you have a cat, try concealing his/her bathroom by storing it in a multi-purpose cabinet just for him/her. 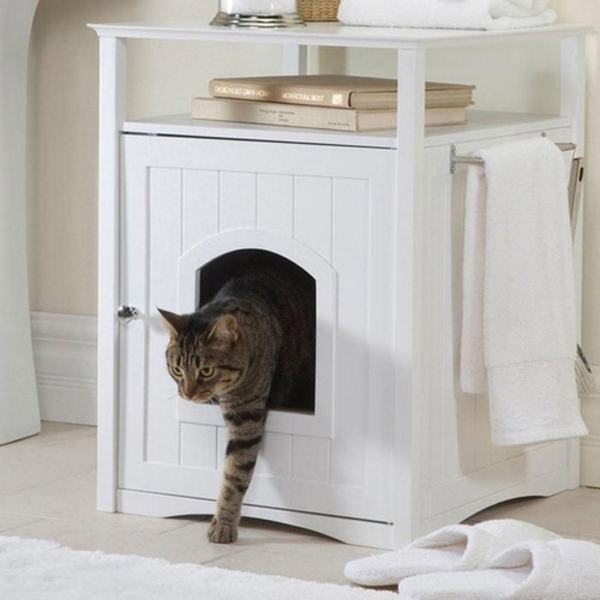 If you want to get a little fancier, you can also purchase more sophisticated multifunctional pet furniture that will give your pet the experience of having their own separate room to rest in as well. Even pets deserve private toilet time. Admit it. Sometimes during a busy week, you are more of the culprit for making a mess than your pet is. 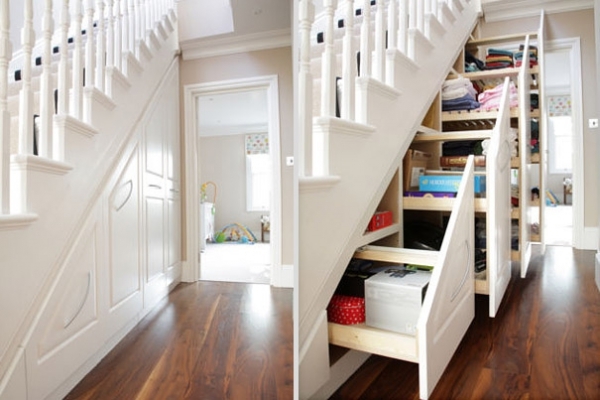 If you find yourself looking for a place to put your things at the drop of the hat when needed, look no further than under your stairs! 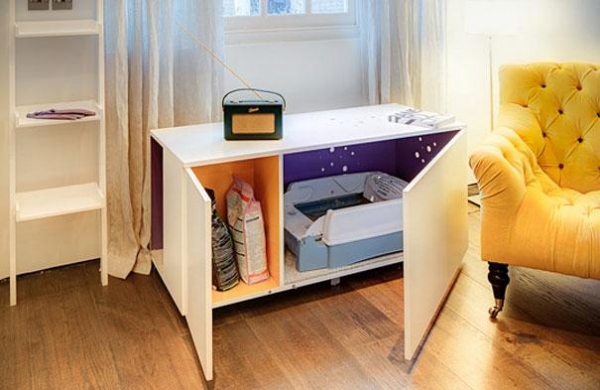 This may be a scary place if you don’t visit it often but by installing some drawers in its spaces, you’ll find that this part of your house is your greatest ally. 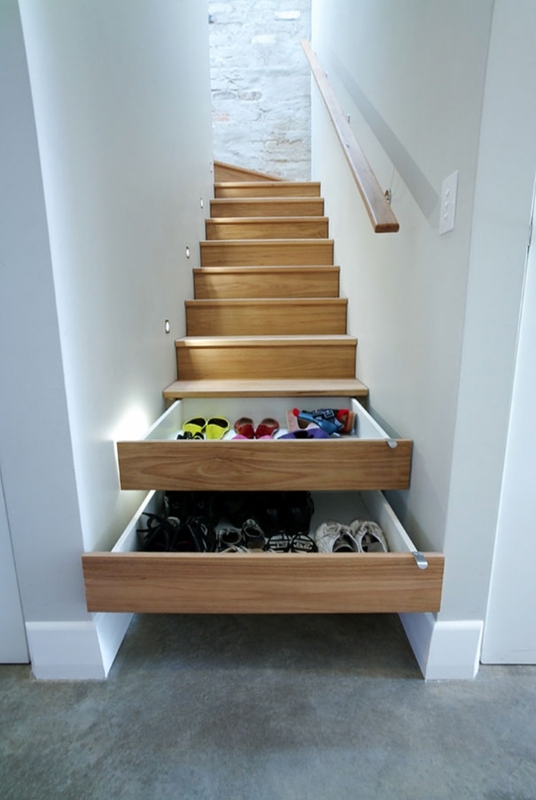 Have you thought about installing drawers in the stairs? If you haven’t, you definitely should! Are you a jewelry addict? 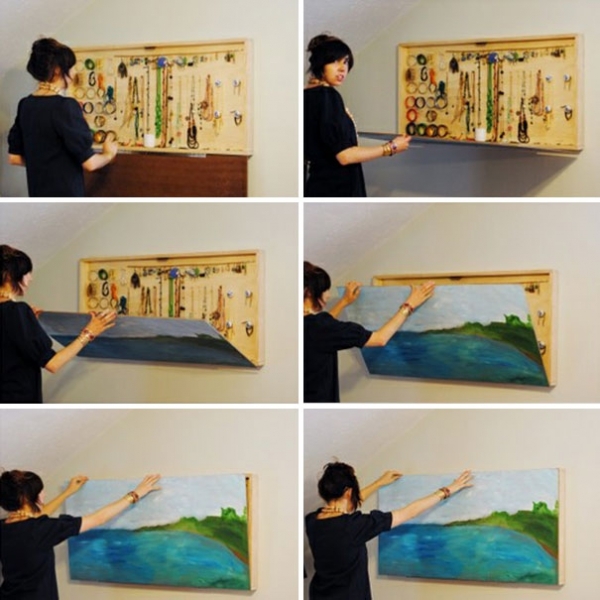 Get creative with concealing your sentimental pieces by mounting a simple DIY shelf behind one of your favorite paintings. They will never guess how valuable your masterpiece really is! Nowadays, electronics are one of the most vital parts of our everyday lives. It’s almost unheard of to walk into a house that doesn’t have some kind of internet service. What will always give that hint away is when the router is sighted amongst many wires. 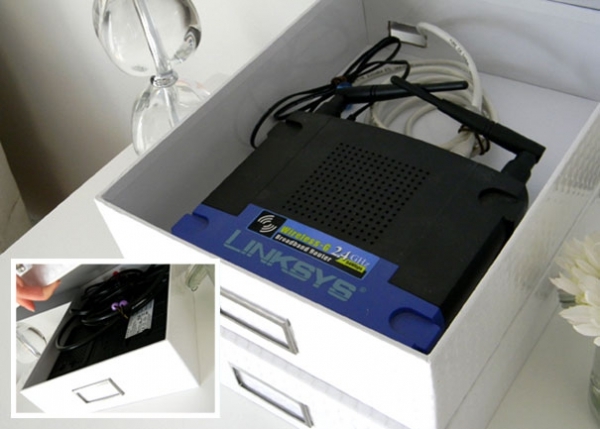 Because routers don’t really mesh with any décor theme you have going on, you can store the router in stylish boxes that also organize the wires. 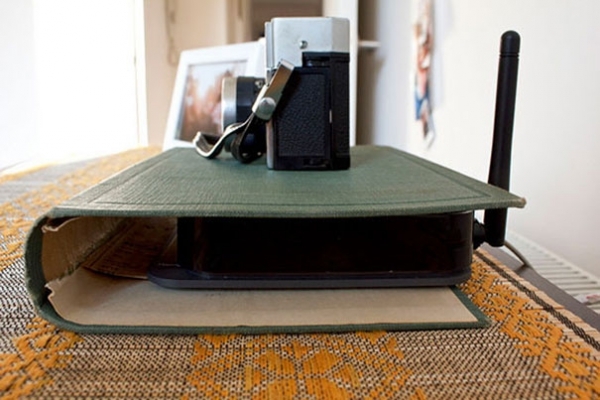 To get even more creative, you can also include the router as a way to recycle your classic old book covers. 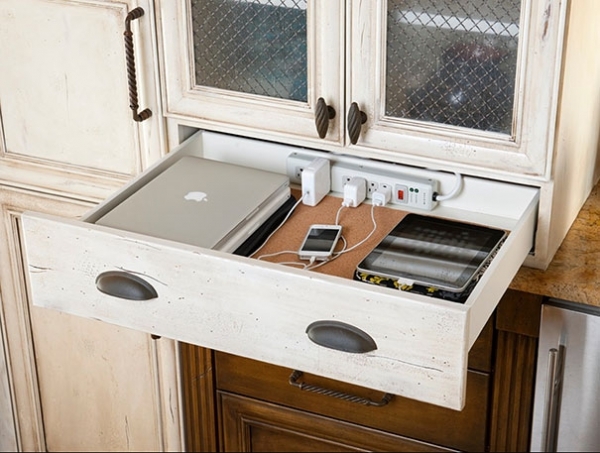 While you’re at it, installing a power strip in your top drawer is a great way to consolidate clutter as well. When eliminating unsightly items from view, the very last thing in your house that you may consider is your appliances. 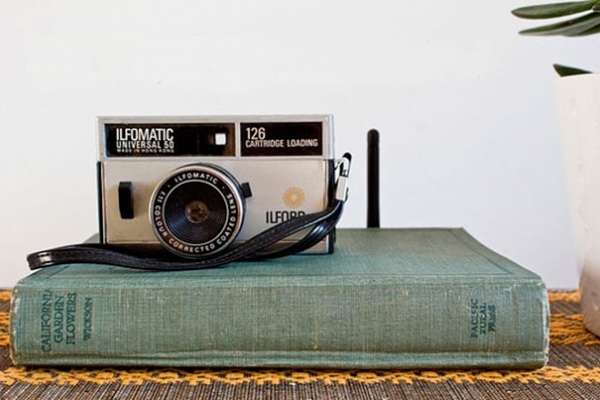 Ironically, your appliances are one of the most important items in the home. Given the size of them, it’s obviously a bit difficult to try concealing them from view so here’s your chance to bring the creativity right to them. 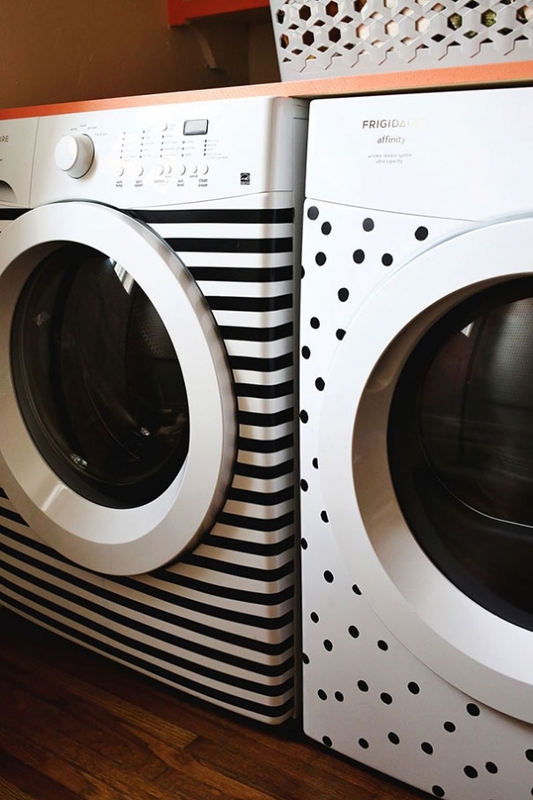 Using some designer tape, you can instantly make your washer and dryer more fun to use by adding cool patterns and designs. 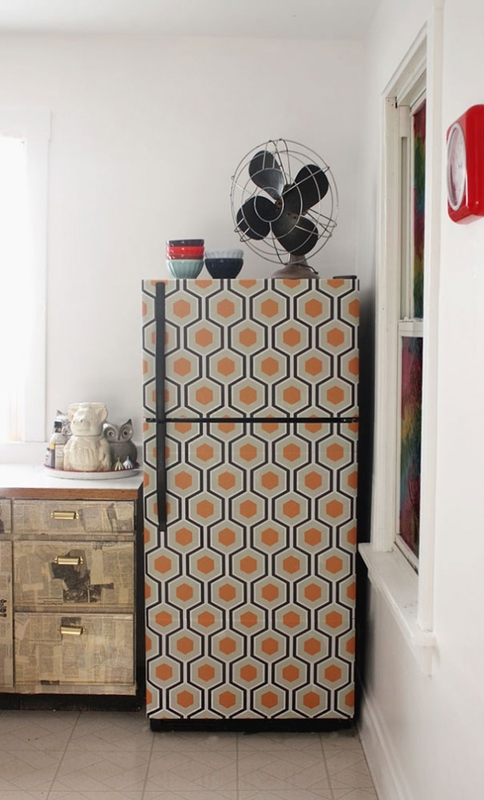 You can also allow your fridge to be the focal point of your décor in the kitchen by adding funky wallpaper designs as well. Who said washing clothes and cooking couldn’t be done with style? 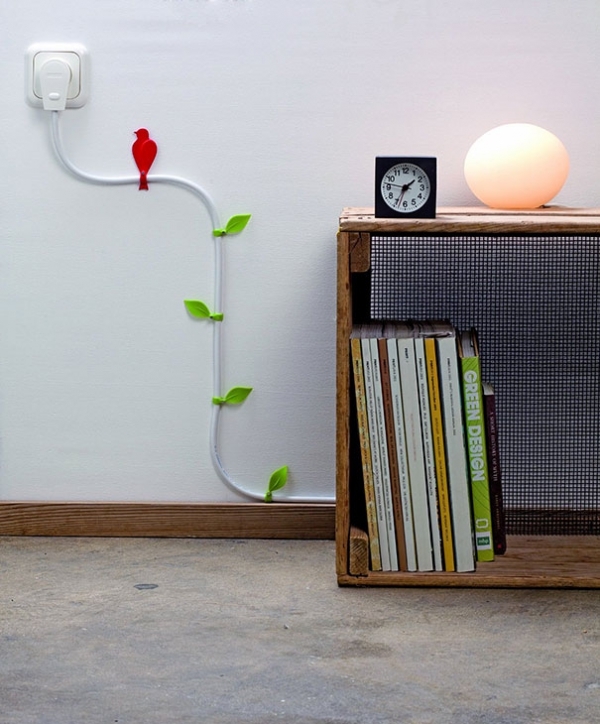 With the right creative spark, your chords and wires can turn into imaginative pieces of décor. If you have an outlet that is usually occupied by a light fixture, make that area more interesting by adding a few bird and leaf appliqués to the wires. 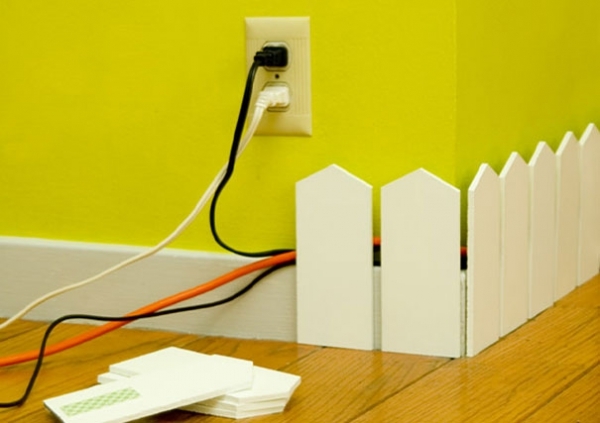 If you have an area in your home that is always bombarded by multiple wires, cleverly hide them behind a miniature DIY picket fence! 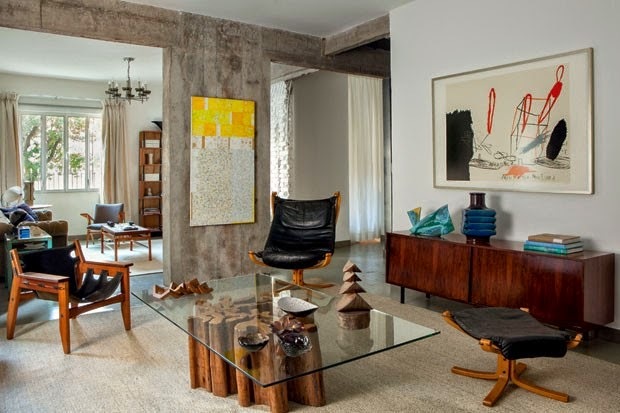 No matter what kind of eyesores you may have roaming around your house; it feels good to know that if you can’t find a proper place for it, you can always create one altogether! We’re sure that having fun with de-cluttering your home now will most certainly have you feeling on top of the world!